In this article, I will cover how to trade with the Coppock curve. You will be able to use these techniques and strategies on any timeframe. Topics will cover a brief overview, how to identify signals and also where the indicator can fail you when trading. The indicator can credit its name to its founder Edwin Sedge Coppock. He created the indicator in 1965 as a momentum indicator to identify long-term buying opportunities in the S&P 500 and Dow Industrials. The RoC is the Rate of Change momentum oscillator which moves above and below the zero line. The default setting for the indicator is 11 and 14 periods. Depending on your strategy, you can adjust the settings of the indicator to greater price sensitivity. For example, instead of using 11 or 14, if you were to use 7 and 10, the curve would give more weight to recent price action. A cross above the zero line calls for a buy. Conversely, a break of zero triggers a sell. If the indicator crosses zero and enters into positive territory than a buy signal is generated. If the indicator falls below zero and enters into negative territory than a sell signal is generated. Below is a chart of Amazon. Buy signals are in blue and sell in red. Below is a 3-minute chart of the PowerShares QQQ Trust. On the open, the ETF moved higher, and the Coppock curve crossed the zero line. This cross to the upside gave us the trigger to enter a long position at $107.61. In true morning breakout fashion, the QQQ began to trade sideways after the open, and the indicator dropped below zero. This drop below zero is our sign to exit the position at $108.20. Below is a daily chart of Goldman Sachs. On the last day of March, the indicator is trending higher and above zero. We open a long position at $156.02 and hold until the indicator breaks zero to the downside over $160. Like every other indicator divergence with price is a possibility. Instead of running from this occurrence, let's discuss how we can profit when these situations arise in the market. A bullish divergence occurs when the market makes a higher high, but the indicator is unable to exceed its previous high. Notice how the stock continues to make lower lows while the indicator was making higher highs. This is a sign that the internals are stronger than the price is indicating. Sure enough, the bullish divergence resulted in price shooting higher. When looking at price divergence a key point is recognizing you may not have a clear inflection point like a double bottom. The divergence is something that may take many periods to develop. At this point I need to make one thing clear, simply buying and selling on moves around the zero line is a sure way to achieve lackluster results. Hence, we need to combine other indicators and tools to validate trade signals. For those of you unfamiliar with the Hull MA, it is a moving average which reacts closely to price like an exponential average but also is smoothed. This presents a clean average which tracks price nicely. 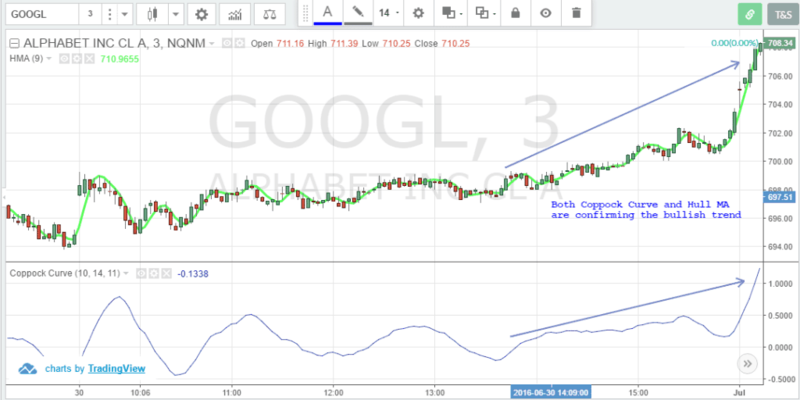 Well in the below graphic is a three-minute chart of Alphabet Inc. with a Hull MA overlay. For this strategy, we will use a cross above the Hull MA with a positive uptick in the indicator as a sign to get long. Notice how both indicators are giving positive signs and thus can keep you in the trade. 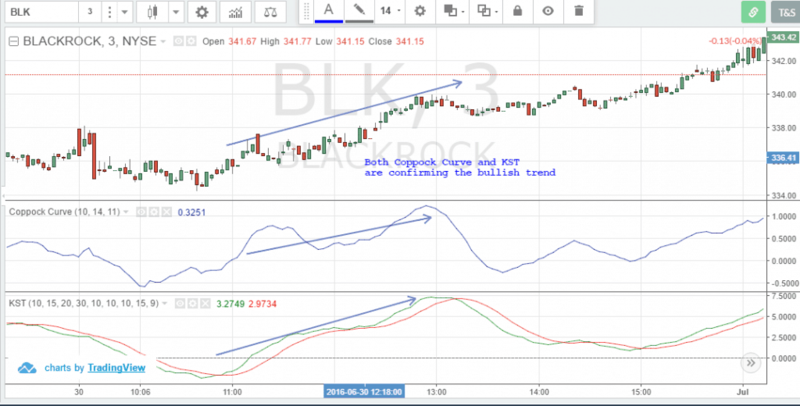 In the below image, you can see the bullish crossover in the Know Sure Thing indicator around the same time the Coppock curve crossed above zero. Again, notice how each indicator is telling the same story. Let’s now combine the Coppock Curve with one of the most popular indicators - the MACD. In the below chart, the MACD histogram was above the zero line, and the Coppock curve was also trending strongly above zero. For this example, you simply fire and forget. The trend was so strong you could let the market do all of the heavy lifting. The Coppock Curve was developed by Edwin Sedge Coppock in 1965 to identify long-term buying opportunities in the S&P 500 and Dow Industrials. A buy signal is generated when the indicator crosses zero and enters into positive territory, while a sell signal is generated when the Coppock Curve falls below zero and enters into negative territory. 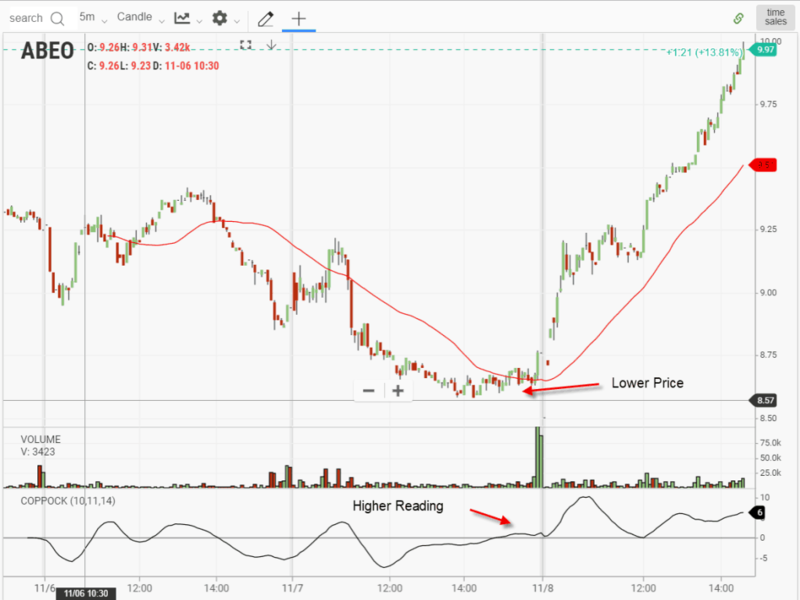 The Coppock Curve could also be traded based on divergences, but we think it’s not a good idea for intraday traders as this could lead to many false signals. The Copper Curve also comes with its shortcomings and gives a relative weak sell or short position signals as compared to the buy or long positions signal. The indicator could be used by intraday traders to identify bullish trends. The indicator could also be traded along with Hull MA, Know Sure Thing Indicator and MACD. If you are thinking about trading with the Coppock curve, you can try it out with the best market replay platform in the world - Tradingsim. You can also practice combining the indicator with other tools or chart patterns to work in increasing your accuracy.